FENCING FOR PETS OK - AVAILABLE NOW! NEW LISTING IN RAINDANCE RESORT - COMMUNITY HAS NEW OWNERS! 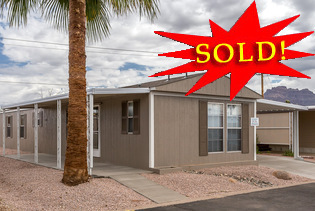 COMMUNITY: Great Views of the Superstition Mountains and Lots of Palm Trees! Community offers Full Schedule of Activities for Active Retirement Lifestyle Including; Bingo, Golf, Group Outings, Hiking, Water Aerobics, Live Entertainment, Dancing, Potluck Dinners, Jam Sessions, Arts & Crafts, Card Games and Much More. Under New Ownership Making Massive Community Upgrades Including Remodeled Pool and Social Area, Pickle Ball, Exercise Room and Much More. UPGRADES/OPTIONS: This Newly Placed Home was just remodeled and is Available for Immediate Move-in. Seller's just Updated this Lovely Home with NEW FLOOR COVERING (LAMINATE AND CARPET), NEW INTERIOR PAINT, NEW VENETIAN BLINDS, NEW PATIO & CARPORT CEMENT AND AWNINGS AND UPDATED CENTRAL AC. This Nicely Appointed Home Offers Large Center LR, Huge Wrap Around China Hutch, Cathedral Ceilings, Feature Mirrors, Wainscoting and Ceiling Fans. Includes UPDATED NAME BRAND APPLIANCES INCLUDING DELUXE 30” GAS RANGE, DISHWASHER, DD/FF REFRIGERATOR AND A FULL SIZED WASHER & DRYER. FEATURES/BENEFITS: Popular Features Include Cathedral Ceiling, Shingled Roof and Dual Paned Gridded Style Windows. Lots of Storage Including Built-in Pantry, Linen Cabinet, Plus Overhead Storage in Laundry Area. Large MBR has Double His/hers Access Wardrobe (Raised Panel Doors), French Door Entry to MBA Featuring Double Sinks, Built-in Linen Cabinets, Garden Tub Plus a Walk-in Shower. Popular Split Floor Plan offers Convenient 2nd BA w/ Tub/Shower Combination and is Adjacent to 2nd Bedroom Located on Opposite Side of Home. OTHER: Low Maintenance Landscaping, Large Rear Patio/Sun Area Perfect for Future Blocked Patio and/or Fence for Pet/Privacy. Amazing Superstition Mountain View!